안녕하세요! 저희들은 Voyagin JTR 티켓입니다. 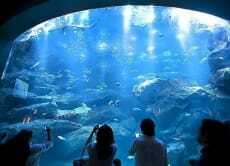 The worlds largest aquarium well worth a visit if in Osaka. There are two whale sharks and a couple of Manta Rays too in the main tank, there are a magnitude of sea-life creatures there animals I never thought I would be able to see in real life. Although there are dolphins in the attraction which we do not support the rest of the aquarium is absolutely amazing and I do recommend a trip! Personally think that Disney Sea and Disneyland is a must do when visiting purely for the atmosphere we took it very easy and didn’t plan to go on many rides but more for the experience, picking up the tickets was a breeze just showed up at the meet up point which was very easy to find and showed my passport, given tickets and was on our way! Highly recommend and repeated the day before for the other park. Personally think that Disney Sea and Disneyland is a must do when visiting purely for the atmosphere we took it very easy and didn’t plan to go on many rides but more for the experience, picking up the tickets was a breeze just showed up at the meet up point which was very easy to find and showed my passport, given tickets and was on our way! Highly recommend and repeated the day after for the other park. The exit was super easy to find and the people with the ticket, i arrived around 11am got some fast tickets for a ride asap! As an adult who loves disney and cool rides! The starwars was the best ever! And monsters inc was awesome! Buzz ride was fun but not worth all the hours of wait so im glad i used my fastpass on this one. After the night parade run to starwars it will only be 10-15min wait, other rides will also be 60min wait at night like Buzz and Monsters inc. Easter snacks and food were awesome! Checkout the gelato cafe for a pink cup and a treat! Grab Todays guide even if its in japanese to see latest merch and food! My insta and yt is Punkybunny or punky bunny japan! Enjoy! This is a good opportunity if you'd like to skip the line. However, in the confirmation e-mail it was written to get the tickets at the "Fast Skytree Ticket Counter", but when I got there, someone sent me away to the "normal" ticket line. That was a bit confusing, but booking this was still worth it!